This is the first installment of our Restoration Global Tour blog series. The series examines restoration success stories in Asia, Latin America, Africa, Europe and North America. Tune in over the coming months for additional installments, or check out our Restoration Diagnostic for more information. A history of deforestation has made Asian nations like Vietnam, China and South Korea especially vulnerable to coastal storms, floods and sandstorms. Yet just as these nations have experienced similar crises, they’re also all pursuing a solution—restoring degraded landscapes. Vietnam has lost more than 80 percent of its mangrove forests since the 1950s. During the American War with Vietnam (1955–75), the U.S. military sprayed 36 percent of the mangroves with defoliant in order to destroy strongholds for military resistance. Since then, extensive areas have been converted into aquaculture, agricultural lands, salt beds and human settlements. More than 102,000 hectares (252,000 acres) of mangroves were cleared for shrimp farming from 1983 to 1987 alone. With diminishing mangroves, the country’s coast became increasingly vulnerable to natural disasters like tropical cyclones. Over the past 30 years, more than 500 people died or went missing every year due to natural disasters, thousands were injured, and annual economic losses totaled 1.5 percent of GDP. So Vietnam turned to restoration in 2001. Northern parts of the country established mangrove plantations, while the South pursued mangrove protection in order to alleviate poverty and diversify livelihoods. The country incentivizes mangrove restoration, conservation and management by allowing citizens to use the benefits these ecosystems provide, such as non-cultivated seafood like clams and crabs. 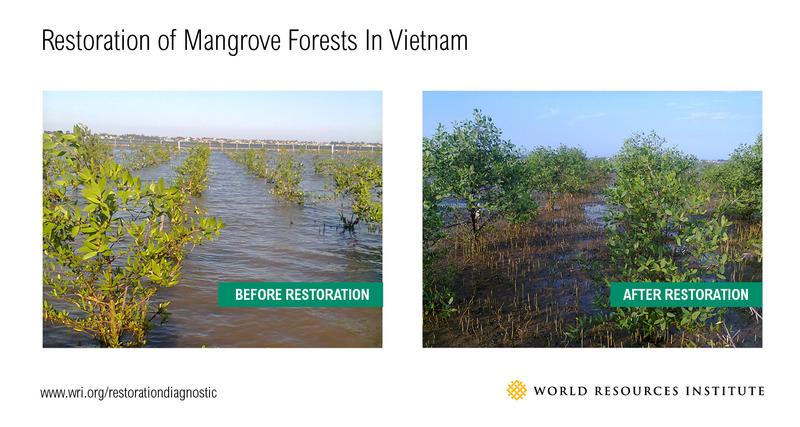 Restoring an area of just 150 hectares (371 acres) with mangroves is estimated to generate VN$21 billion ($938,000) over 22 years. Restoration efforts added 18,000 hectares (45,000 acres) of new mangroves between 2001 and 2008, but more restoration is needed to adapt to the increasing threat of climate change and severe weather events. In its new national climate plan (known as an Intended Nationally Determined Contribution, or INDC), Vietnam pledged to increase forest coverage to 45 percent and increase the area of protected forest in coastal areas to 380,000 hectares (939,000 acres), including an additional 20,000 to 50,000 hectares (49,000 to 124,000 acres) of mangrove planting by 2030. Soil erosion in China’s Loess Plateau created massive sand storms in Beijing throughout the 1980s and 1990s, including the infamous “Black Wind” of 1993. Soil erosion reached such extremes that the plateau contributed more than 90 percent of the total sediment entering the Yellow River. Farmers were forced to abandon their land due to soil degradation, resulting in economic losses of approximately $1.28 billion and threatening food security. So the government turned to restoring degraded landscapes through policy changes. After 1999, the government banned cutting trees, growing crops on slopes, and allowing unrestricted grazing in the Loess region. Combined with the replanting of vegetation, these bans allowed the perennial vegetation cover to double by the mid-2000s and decreased the number of sandstorms. China’s new climate plan aims to build on these restoration successes by increasing forest carbon stocks by 4.5 billion cubic meters. This amount of forest would create a roughly 1-gigaton carbon sink, equivalent to stopping tropical deforestation for almost a full year, or taking 770 million cars off the road. Almost half a century of war wreaked havoc on South Korea’s forests during the first half of the 20th century due to excessive harvesting of wood for timber and fuel. By 1952, the nation’s forest stocks were less than 50 percent of pre-war levels, threatening national energy security because firewood and charcoal accounted for a majority of power production. 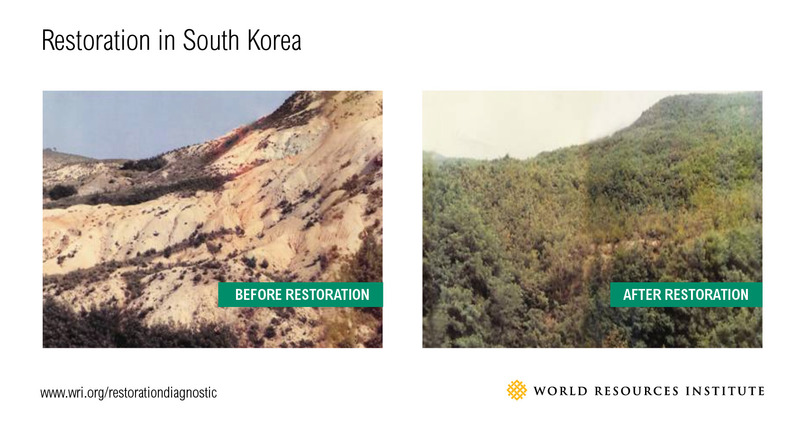 Today, it’s a different story, as South Korea is widely regarded as one of the world’s most significant restoration successes. Between 1953 and 2010, national tree-planting and public-pride campaigns increased the country’s forest cover almost two-fold and its tree density 13-fold, while the population doubled and the economy grew 25-fold. The estimated monetary value of the benefits from these restoration efforts—including increased water storage capacity and curtailed erosion—is greater than $92 billion, approximately 9 percent of the country’s GDP. Even though Vietnam, China and South Korea successfully restored areas of forests, the Restoration Diagnostic reveals that challenges remain. For example, South Korea focused almost exclusively on planting coniferous forests—the resulting lack of species diversity and tree age increased susceptibility to pest and disease outbreaks in recent years. Furthermore, South Korea is among the major destinations for timber exports from countries most badly affected by illegal logging. Effective forest landscape restoration should avoid transferring forest-clearing activities to other locations (known as “leakage”). 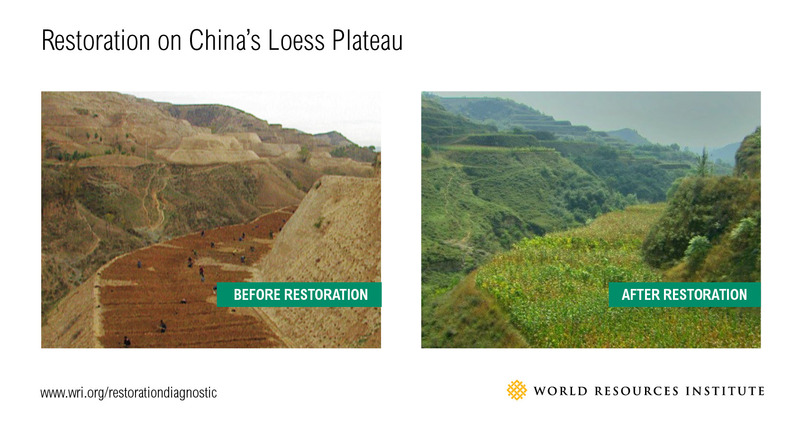 While China focused heavily on afforesting the Loess Plateau, scientists are increasingly debating the long-term sustainability of this practice in such a semi-arid environment. For instance, of the 400,000 Chinese pine trees planted in northern Shaanxi, only 25 percent survived. Many people misinterpret restoration as being synonymous with tree planting. Whilst trees can stop storms and deserts, they are not the only solution, but one in a toolbox of restoration options, such as grassland restoration, climate smart-agriculture and agroforestry. In the coming months, we’ll take you on a global tour of restoration successes, looking at highlights from Asia, Africa, Latin America, Europe and North America. In the meantime, check out our Restoration Diagnostic for more information.